In this feature we talk to Mariko Strickland Lum. 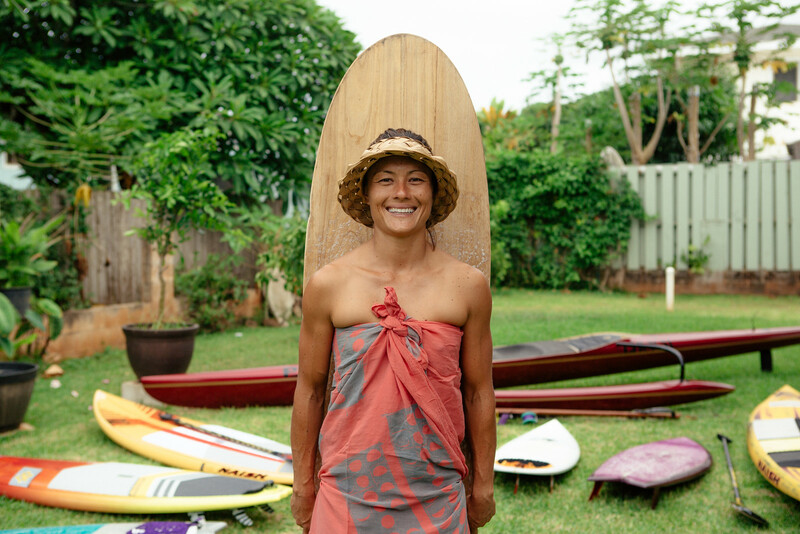 A soccer star turned stand-up paddleboarding champion, this Woman In The Wild calls Hawai'i home and is most likely to be found spending as much time as possible on the ocean. Get the full scoop below. Photo by Christian Kahahawai Photography. OP: Give us the skinny on who Mariko Strickland Lum is. Mariko Strickland Lum: I was born and raised on the island of Kaua’i and attended a boarding high school on O’ahu called Mid-Pacific Institute. I was recruited to play Division 1 collegiate soccer at San Diego State University, then I transferred to play at Cal State Long Beach, where I graduated with a degree in Kinesiology. The year after college, I won a national championship playing semi-professional soccer for Ajax in Palos Verde, then moved back home to Kaua’i. Upon moving home, I entered a local stand-up paddleboarding race, ended up winning the entire race, and just like that stand-up paddleboarding became my competitive rebound. While competing I was a waitress and substitute teacher, then I ended up teaching full time, ran a non-profit foundation, started my own business called Adventure Fit Kaua’i, and now work at The Club at Kukui’ula as the Ho’okipa Ambassador (hospitality manager). Somewhere in-between I married the man of my dreams who is a lifeguard, fisherman, and overall amazing waterman, Kainoa Lum. I love to travel and do anything outdoors! Mariko Strickland Lum: Between trail blazing through grassy wild pig tunnels, climbing on lilikoi vines, and biking to empty fresh water swimming holes as a kid, I’m not sure the thought of not spending my life outdoors was even a viable option. Mariko Strickland Lum: Being recognized as a woman in the outdoor industry means I carry a responsibility to be a good steward of my community in all my actions. It means positively representing how humans, both male and female, can coexist in the outdoors while taking care of our natural elements, which is the soul foundation of our industry. I would suppose it also means I am recognized as a role model to fellow women and aspiring young ladies; therefore, it means my lifestyle is looked at in ways that hopefully inspire others. OP: What has the outdoors done for you, and how do you pay it back? Mariko Strickland Lum: It may sound cliché, but the outdoors has played a huge role in shaping me into the person I continue to aspire to be. It is my ultimate playground, my happy place, and it allows me to have a career that I absolutely love. I give thanks by doing my best to leave a small eco footprint in my daily life and a big impact in efforts to malama the aina (take care of the land). Whenever I have the opportunity, I like to link up with larger cleanup efforts and with amazing non-profit organizations such as Sustainable Coastlines. However, I tend to focus more on my individual and immediate family efforts such as cleaning up our beaches, eliminating single-use plastics, recycling, and conserving water, and I try to incorporate these efforts into a lifestyle rather than a fad or one-time effort. Hopefully in the process I inspire others, and together we keep paying it forward. OP: Conservation and protection of our public lands are central themes in today’s outdoor recreation narrative. As someone who spends a significant amount of time outdoors and on public lands, what role do you think stand-up paddleboarders - and outdoor enthusiasts, in general - should play in this evolving conversation and landscape? Mariko Strickland Lum: Stand up paddle boarders or any outdoor enthusiasts for that matter carry a responsibility of operating in ways that help to conserve and protect our public lands. This could range from the sunscreen we use to protecting our waters, carpooling to limit gas emissions, limiting waste usage while traveling to various communities, etc. I would love to see SUP races or any outdoor extreme sporting events set a precedence by limiting single use plastics, excess waste, and hosting a community cleanup effort with any major event hosted. One of my favorite things about the Ho’olaulea race, hosted by Olukai, is the “give back day” hosted every year by their Ama Olukai Foundation. Usually it is on Mau’i but this year since the flood occurred in such proximity to the event, we organized efforts on Kaua’i. We linked up with local farmers at Limahuli Gardens to realign the entire water piping system so their lo’i could receive water once again. The task was so overwhelming that we weren’t sure we would be able to get it done in one day, but our teamwork and operational system was so in sync that leaving the job unfinished just was not an option. It was an amazing day that I will never forget and will forever be grateful for Olukai’s enthusiasm to organize efforts to help my community in a time of crisis. It says a lot when a company’s employees, including Executives and investors are willing to dive in and be in the thick of it all, getting dirty and working very hard to malama a place in need. For me, this truly shows that Olukai is sincerely invested in giving back to the culture and community that is imbedded in their products; they don’t just represent the lifestyle, they live it; and I feel fortunate to be part of this ohana. Mariko Strickland Lum: My biggest inspiration comes from those who quietly go about doing their thing, mostly in sport, but also in entrepreneurial or community efforts. They do it all for the love and no glory, especially those who may have a physical disadvantage. Also, other badass women and men who I have competed with or met during sport, my parents, and progressive thinkers in my community. Mariko Strickland Lum: To me adventure means stepping outside your comfort zone to explore new boundaries in nature and overcoming something in the process. Mariko Strickland Lum: Badass to me is someone, something, or an organization whose actions or values surpass normal expectations and who just blows your mind with next-level inspiration. OP: How have you managed to align your career with your passion for the outdoors? And do you have any advice for someone who is looking to do the same? Mariko Strickland Lum: I am a firm believer that life should be fun, and it is so important to have positive passions in life that you absolutely live to do. For me, it’s athletics; mainly in the water, but basically anything that is physically intensive. When you are that passionate about something, I think it is bound to align with how you provide for yourself in terms of a career. I managed to align my career with my passion for the outdoors through hard work, patience, and probably good timing. I have had some jobs that I knew would be temporary, but I learned a lot, and these jobs allowed me to live my lifestyle and provided me with the opportunity to involve myself in things that would later add value to my current career. My advice for someone looking to do the same would be: Despite what anyone tells you, your career can and should be something you enjoy doing. I made my reality so that I absolutely love my “career,” your reality is in your control. Be patient, enjoy the journey, and don’t be afraid to take on temporary “jobs” that may not seem the most appealing, because they might just be small stepping stones to get you to where you’re going. Never forget, your career path does not have to be confined to the societal norm, and despite what anyone says, sometimes you can have your cake and eat it too. OP: We are seeing a shift in what the term woman or female might bring to mind (size, shape, color, sexuality, gender identification, etc. ), both in the outdoor community and throughout the world. What does being a woman mean to you? Femininity? Mariko Strickland Lum: Being a woman to me is an individual who is mentally and physically strong on her own, who loves herself but is always striving to be better. Although the terms femininity and masculinity are generally stereotypical gender specific behavioral expectations, I believe both women and men can share attributes from both categories. I was THE biggest “tom-boy” growing up and I am still very competitive, athletic, strong, not afraid of getting dirty, and outspoken. All characteristics that sometimes people like to characterize as masculine, but to me that’s what being a woman is all about. Don’t get me wrong I also appreciate a gentleman who is first to open a door or carry the heavier load, but have no problem doing it myself or for a male counterpart. Whether friends, partners, or colleagues, we can do these things for each other rather than getting caught up in gender specific roles. Mariko Strickland Lum: Enjoy the journey; life is about having fun and being balanced. If you’re not happy, do something about it! Mariko Strickland Lum: In a perfect world the outdoors looks very clean and pure. It's free of rubbish, lush with greenery, live coral, an abundance of fish and underwater life, flourishing forests, healthy native animals, limited human access, and perfect, uncrowded right-hand point breaks! Outdoor brands can help by making a shift to sustainable business operations and more eco-friendly standards. Media companies can help by positively supporting brands who support the outdoors and expose those who do not. A big one for us in Hawai’i right now is the use of sunscreen that contains chemicals that are harmful to our coral reefs. Bringing awareness to this issue and providing readers with brands that are baby and reef safe would be huge! Mariko Strickland Lum: I don’t leave home without a bikini and reusable water bottle. Mariko Strickland Lum: I love women-specific gear because our bodies are shaped differently, hence, women-specific gear fits much better, is more flattering, and is more comfortable overall. Mahiku Activewear, OluKai, and Lululemon are my favorite outdoor apparel brands. Mariko Strickland Lum: From the moment you were born you were complete on your own. You hear people say all the time that their significant other “completes them as a person,” which I have to disagree with. Your life partner should complement you, not complete you. This was spoken by an “inspirational speaker”in college and I’ll never forget it. I used to be a PE teacher and this is a value I would press upon my students, especially the middle and high school kids. As teachers we had meetings about students dealing with suicidal thoughts and even attempts. A common scenario we came across was students who came from a dysfunctional home, finds a boyfriend or girlfriend who “completes their life,” but when the break up occurs they feel like their life is worthless. As teachers or mentors it is our job to instill self-confidence in our keiki so they love themselves and value their life more than anything in the world. Mariko Strickland Lum: If you didn’t see it on social media, it didn’t happen, right? Haha! I approach social media with an open mind and use it as a platform to inspire or educate myself as well as others, hopefully. For work it’s great, because it’s free advertisement, allows me to connect with like-minded people or organizations, and it showcases the amazing experiences AFK and Kukui’ula provides. However, socially and athletically I think we can all agree sometimes there is too much energy placed on documenting the experience rather than just enjoying the moment, like we used to do prior to social media. Coming from a place like Kaua’i, where photographing certain areas is limited, especially when it comes to the surf, it can sometimes be a challenge maintaining balance in sharing all your adventures while staying true to your roots. It can especially be difficult when you have contracts with sponsorships or you’re trying to lure more opportunities by exploiting your lifestyle. However, at the end of the day, the respect of my community and preservation of my homeland surpasses any fame or potential endorsement opportunity. Plus, it’s too much work to constantly be posting world-class photos all the time, haha! In my experiences, I’ve realized that good companies that you want to be associated with mostly care about the relationship you establish, how you represent yourself in real life, and that social media posts are positive. The evolution of social media has opened a whole new world that allows businesses to grow very quickly, people and places in crisis to receive instant support, and collaborations, opportunities and friendships to be born. However, it is our responsibility to appropriately manage our individual use and exposure. OP: If you could give yourself one piece of advice when you were just starting with Adventure Fit Kaua’i, what would it be? Mariko Strickland Lum: Sometimes you must give up one of many things to allow space and energy for that one passion to truly flourish. Mariko Strickland Lum: A few SUP races, possibly a surf trip, and a snowboarding trip! I'll also be doing a waterman/woman camp in Puerto Rico with Chuck Patterson. We will have detailed information out soon! Mariko Strickland Lum: A bird. Mariko Strickland Lum: Remember to enjoy life and have fun! Learn more about Mariko by following along on her adventures via Instagram and Facebook.